In this guide "how to get started in RC" I will take you through all the key points to consider when starting out. What’s the first thing you think of when you hear “remote controlled car”? If a kid’s remote controlled car is the first picture that pops up in your mind, then you’re probably not an enthusiast of remote controlled vehicles yet. But, it doesn’t have to stay that way forever! Believe it or not, remote controlled (R/C) vehicles are a very serious hobby for a lot of us. The cars and trucks we play with aren’t kids’ toys, either. They’re usually extensively-detailed, scaled-down models of actual cars and trucks. They also typically have real, scaled-down versions of actual vehicle parts, such as a motor, a steering servo, a drivetrain, suspension, and other parts. R/C hobbyists look for realism and performance over all else. We’re willing to pay a hefty price for those two things. But, don’t let the price tags on R/C vehicles scare you away! There are a lot of affordable options out there, as well as a few models specifically made (and priced) to appeal to folks who are new to R/C. However, we’ll be the first ones to admit that R/C vehicles can be tough to get into at first. That’s especially true if you aren’t familiar with cars and car parts. Manufacturers like Traxxas and Axial (probably the two most well-known R/C brands out there) are quick to talk about portal axles, high-torque brushless motors and 4S LiPo power. While seasoned R/C hobbyists will know what all of those words mean, a newcomer will likely be at a loss. That’s why we took the time to write this starter’s guide for those of you who are new to R/C, particularly R/C trucks. We will try to explain what types of R/C trucks there are, the differences between electric and nitro-powered trucks, the sizes and scales of R/C trucks and whether you should invest in a pre-built (“ready-to-run”) vehicle or buy a kit. We will also cover what types of motors there are, the suspension, wheels, tires, and battery connectors and chargers. True to its name, this starter’s guide is for complete newbies. Everything, even the very basic aspects of R/C vehicles, will be talked about here. 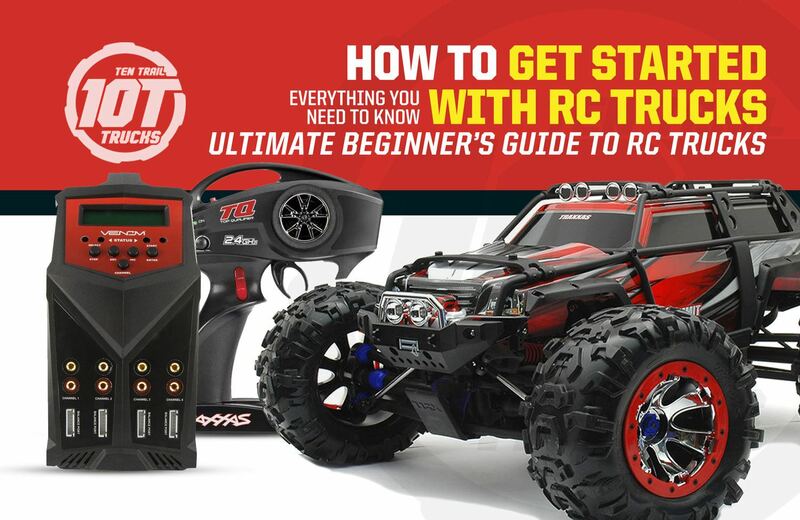 Hopefully, this guide will kickstart your journey as an R/C vehicle hobbyist and help you invest your time and money when searching for the perfect Truck. What type of R/C truck is best for you? There are quite a few types of RC trucks. That shouldn’t come as too big of a surprise, with how many types of trucks there are. After all, many R/C vehicles are just scaled-down models of the cars and trucks you see at auto dealerships and on the road. With all that variety, it can be tough to choose one. Which is why we will try and elaborate on what types of R/C trucks there are, what each type is meant for, and other important bits. True to its name, the monster truck is the monster of R/C trucks. Just like normal-scale monster trucks, they’re characterized by a larger suspension/ride height and those iconic mammoth tires you see on trucks such as the Grave Digger. Due to their enormous ground clearance, monster trucks usually make for great off-road vehicles. They aren’t typically very fast since they don’t handle as well as smaller trucks do at higher speeds, but that also plays into their amazing off-road performance. If you want flashy and oversized in an off-road vehicle, a monster truck will serve you well. However, they tend to also be pricier, especially the premium models from Traxxas and Axial. The Axial Yeti and Traxxas Maxx lines are examples of R/C monster trucks. As the name suggests, rock crawlers are meant to do one thing very well: drive over rocky terrain. They are, for all intents and purposes, modified monster trucks, designed so they can cross over very harsh terrain, where no other vehicles can. Rock crawlers are usually outfitted with portal axles, locking differentials, tires designed for off-roading, and a high-torque motor. They’re also incredibly sturdy, usually equipped with a roll cage, rocker panels, and tube fenders. Rock crawlers are slow, but being fast isn’t what they’re meant for. As far as off-roading and driving over rocky terrain go, nothing beats a rock crawler. If that’s what interests you, you can’t go wrong here. The buggy is the trimmed-down, lightweight cousin of monster trucks and rock crawlers. In other words, the exact opposite of the enormous wheels, tires and armored shells you get with those two vehicle types. Buggies are open-wheeled, which just means their wheels are outside of the main body. Generally, the motor will also be exposed in the back. Buggies can either be roofed or roofless. A characteristic of buggies is their low ride height and ground clearance. This allows them to be a lot faster than monster trucks, rock crawlers, and SUV models, but it also means they’re not very great for off-roads or grass. If you’re more of a racer than an off-roader, a buggy is a good choice. Stadium trucks are similar to buggies. It can be said they are to buggies what rock crawlers are to monster trucks, in a way. Stadium trucks usually have a larger suspension and are better tailored for the off-roads. However, they perform well on most surfaces, including dirt, gravel, and concrete. Stadium trucks, or “truggies” as they’re often called, are great all-around vehicles and a good choice if you’re unsure about which surface you want to drive on, since they handle well on most of them. Aside from the different types of electric motors available, R/C cars and trucks can also run on nitro. A nitro engine runs on a nitromethane-methanol fuel. Because nitromethane is highly flammable, it’s usually only used as a fuel in drag race cars and in R/C vehicles, since the fuel amount is very small in the latter case. The most obvious difference between a nitro engine and an electric motor is that nitro engines run on fuel, while electric motors in R/C vehicles are powered by a battery, usually lithium polymer (LiPo) or nickel-metal hydride (NiMH). Of the two, electric motors are the less expensive option, for a few reasons. Firstly, R/C vehicles that run on nitro engines tend to be on the pricier side. And secondly, nitro engines are costlier in the long run, since they require refueling, while LiPo/NiMH batteries can be recharged. Electric motors are also “cleaner” than nitro engines, for obvious reasons (no exhaust fumes). As a result, electric R/C vehicles can be run indoors, whereas nitro-powered cars normally shouldn’t be. Nitro engines are noisier, which can be a problem if you plan on driving your R/C car or truck around the neighborhood. Nitro engines used to be faster than electric motors, but brushless motors have largely surpassed them in that regard. Unlike nitro engines, electric motors don’t need to be broken in or tuned. In general, nitro engines require a fair bit of maintenance work. That includes cleaning the engine and air filter after longer sessions, as well as draining the fuel tank. Lastly, nitro fuel can be a hassle to buy, if you don’t have an R/C shop near you. Then again, in the age of Amazon, that probably isn’t as big of a problem anymore. Nitro engines have a few key advantages over electric motors, however. Namely, nitro engines have longer run times. What’s more, you can just add more fuel to keep your R/C car or truck running, whereas with electric motors, you have to recharge/replace the battery. Recharge times aren’t as awful as they used to be, but they’re still on the longer side (typically 45 minutes to an hour). LiPo batteries aren’t very cheap either, but at least they’re rechargeable. While the exhaust fumes can be a turn-off and the noisiness of nitro engines can get on your neighbor’s nerves, a lot of R/C hobbyists actually appreciate those things, as they give the vehicle a more realistic flair. At the end of the day, it all comes down to personal preference. Generally, we don’t recommend nitro-powered vehicles to beginner hobbyists. They require more maintenance, cost more in the long term and aren’t as versatile as electric R/C vehicles. Their biggest advantage – longer run times – isn’t all that important to newbies. That’s not to say you should avoid nitro engines completely, but if you’re just starting out, electric is an all-around safer choice. It’s likely you’ve seen the word “scale” used more than once in R/C vehicle spec sheets. It’s a word that’s tossed around a lot in the R/C community. But, what exactly is the “scale” of an R/C vehicle? Simply put, an R/C vehicle’s scale is its size relative to the vehicle it’s modeled after. A 1/10 scale Jeep Wrangler R/C model is 1/10th the size of an actual Jeep Wrangler. However, don’t expect draftsman levels of precision. A 1/10 scale model is rarely ever truly 1/10th the size of the vehicle it’s modeled after. But, hey, it looks about right. The most common scale sizes are 1/6, 1/8, 1/10 and 1/12, but mini-models can be a lot tinier, in the range of 1/28 to 1/64. Should you buy a kit or RTR (Ready-to-Run)? With most R/C cars and trucks, you usually have two options: you can either buy a finished vehicle (“ready-to-run” or RTR), or you can buy a kit to assemble it yourself. Of course, what you choose is entirely up to you. For many R/C hobbyists, assembling the vehicle is part of the experience. However, if you don’t trust yourself to assemble a vehicle correctly, or if that just doesn’t interest you, most R/C vehicles come in “ready-to-run” options. At the end of the day, it boils down to personal preference. The motor isn’t the only thing inside your R/C vehicle that’s responsible for making it tick. Aside from the motor/engine and batteries/fuel, there are a few other key components as well. In this section, we will talk more specifically about the transmitter and receiver, the ESC (electronic speed control) and the steering servo, all of which are vital parts of your R/C car or truck. An ESC is, to put it plainly, what allows you to control how fast your R/C vehicle is running. Electric motors, like the ones found in most R/C vehicles, can either be turned on or off. Without an ESC, your R/C car would either be still or running at full-throttle. That’s not very useful, is it? ESCs are specific to the motor type. A brushed motor requires a brushed ESC, while a brushless motor requires a brushless ESC. We will talk in more detail about what brushed and brushless motors are below. A car or truck that can only drive in a straight line isn’t any fun either. A steering servo (most of us just call it a “servo”) is what controls the steering. After it receives an electrical signal from the receiver, it adjusts the car’s steering arms accordingly. Servos are very important components as they can make or break your R/C vehicle. An underpowered servo can be a major problem. Higher-torque servos (rated in ounces per inch) are generally a better option for larger models. As it is for normal-scale vehicles, the motor is one of the most important parts of any R/C vehicle. Virtually all R/C vehicles are powered either by a brushed or brushless DC (direct current) motor. (I have yet to see a commercially-sold R/C car or truck powered by an AC/induction motor). Brushed and brushless motors are very similar. They both run on DC (direct current) power, but the key difference is the presence of “brushes” in the brushed motor vs. the lack of brushes in a brushless motor. Don’t worry, we won’t bother you with all of the nitty-gritty. That’s not what matters, after all. What matters is what effect all of that has on your R/C vehicle’s performance. Brushed motors are a low-cost solution. They have very simple wiring, which means you can easily disassemble a brushed motor to replace the brushes once they’ve worn out. However, most R/C cars and trucks come with sealed motors, which means they must be replaced by the manufacturer. Lastly, brushed motors are less efficient than brushless motors. Brushless motors are more efficient and will run for longer than brushed motors. They have a longer lifespan since they don’t have brushes which are prone to wear. That also means brushless motors require less maintenance (however, as most R/C vehicles have sealed motors anyway, that isn’t as important here). The trade-away with brushless motors is that, of course, they’re more expensive than brushed motors. Brushed motors are graded by the number of turns (T). The lower the number of turns, the “faster” the motor runs. In other words, a 10T (10 turns) brushed motor will, if all else is equal, run faster than a 20T motor. “Performance” motors are usually in the 5 to 10T range. Brushless motors, on the other hand, are rated in terms of kilovolts (kV). In this case, it’s the opposite of what the number of turns of brushed motors means. The higher the kV of a brushless motor, the higher the RPM and the faster the motor runs. Also, there are two subcategories of brushless motors: sensored and sensorless. Sensored motors are able to “detect” the rotor through the Hall Effect, which is named after American physicist Edwin Hall. It then sends that data to your R/C vehicle’s ESC through an additional wire. That allows the ESC to more precisely control the motor, which results in smoother handling, especially at lower speeds. Again, the trade-away is the price. Sensored motors are more expensive than sensorless motors. Given everything you have read above, it’s obvious that brushless motors are superior to brushed motors, if we look at them side-by-side. However, a faster motor isn’t always automatically better. We talked about monster trucks and rock crawlers above and how they don’t handle well at high speeds. That’s still true, even if you have a sensored brushless motor in yours. That said, it’s clear that a brushless motor with lower kV, but more torque will perform better than any brushed motor, even inside a monster truck. And, of course, a sensored brushless motor handles more smoothly at lower speeds, which is ideal for an off-road rock crawler. All in all, brushless motors are clearly the better of the two, but will set you back more as a result. A brushed motor works well enough and is low-cost, but it isn’t as efficient, powerful or as fast as a brushless motor. What you choose depends entirely on your budget and what you want from your R/C vehicle. A heavier, bulkier truck designed for crossing over harsh terrain doesn’t need a lot of RPM, so a brushless motor with lower kV or a brushed motor with a higher number of turns works well. Of course, if you’re in the market for a race car, a sensored brushless motor with high kV will do the job like no other motor can. At the end of the day, it’s all personal preference. Your R/C vehicle’s suspension is what allows its wheels to move up and down independently of the body and chassis. If you aren’t a car person, you may wonder why it’s important for a vehicle’s wheels to be able to do that, but it actually serves a crucial function: to absorb bumps, jumps and other stress beneath the wheels. Specifically, it’s the shocks that do that. Pricier R/C trucks have oil-filled shocks, which are usually better at withstanding stress than spring-mounted “friction shocks”. If you’re used to toy R/C cars and trucks, it’s likely you’re in the mindset that wheels and tires are just four chunks of plastic meant to lightly resemble actual wheels and tires. But, that isn’t the case with hobby-tier R/Cs. Their tires are usually made of rubber and fitted with a high-traction foam insert instead of being filled with air. Tires are glued to the rims of wheels with cyanoacrylate glue. These typically wear out very quickly on hard surfaces and have low traction. Ribbed tires are usually only fitted on the front wheels of vehicles with two-wheel drives. They give great side-to-side traction and excel on the off-roads. These have medium-to-low wear on hard surfaces, but give good side-to-side traction. Slicks are usually made of rubber, but can also be made of foam. These give a lot of traction on hard surfaces and very little off-road. These wear out quickly on hard surfaces, but give superb traction on sand. These are very similar to slicks, with slightly improved traction on wet surfaces. These have medium-to-high wear on hard surfaces, but give off low traction. As mentioned above, R/C vehicles run on either lithium polymer (LiPo) or nickel metal hydride (NiMH) batteries. In the past, most R/C models ran on nickel cadmium (NiCd) batteries instead, but NiCd has largely been phased out in favor of LiPo and NiMH. As far as numbers go, the ones you should pay attention to are voltage (V), milliamp hours (mAh) and, for LiPo at least, the C-rating of the battery. Voltage is a measure of electric potential difference or electric pressure. To put it plainly, a higher voltage means more power. A battery’s capacity is measured in milliamp hours (mAh). The higher the number, the longer the battery’s charge will last. Lastly, LiPo batteries have a C-rating. A C-rating is a measure of how much amperage the battery can supply. Most LiPo battery packs are in the 20 to 30c range, which is enough for almost any stock brushed motor out there. For a high kV/amperage brushless motor, you may need batteries in the 30 to 50c range. As far as which type of battery is better, LiPo is generally more efficient and provides more charge than NiMH. However, LiPo batteries cost more and require careful handling. LiPo batteries must be stored and charged properly. That means you must use a charger specially designed for LiPo batteries and all of the battery’s cells must be charged evenly. Overcharging a LiPo battery or leaving it out in the heat can cause it to combust, so be careful! If you feel like all of that’s a hassle, then try to avoid LiPo and go with a NiMH-supported vehicle instead. Certain vehicles also support both LiPo and NiMH. Unless your R/C vehicle is nitro-powered, you will have to pay close attention to your choice of battery connectors and chargers. Battery connectors are what the LiPo/NiMH batteries in your R/C model use to connect to the ESC and motor. Their job is to transfer power from the batteries to the parts of your R/C that need it, such as the motor, ESC, servo, and receiver. There are quite a few brands to choose from, enough to warrant a separate article. Deans connectors are generally considered the highest-quality battery connectors on the market, but new and more affordable competition has sprung up as of late. As you’re a beginner, it’s probably not a bad idea to just stick to the stock connectors in your R/C vehicle. As we talked about above, the battery type you use matters, since LiPo batteries require a charger specially designed for LiPo. However, that’s not the only important bit about chargers. Buying a fast charger is a must if you don’t want to have to wait an hour or two for your R/C vehicle to charge. As with battery connectors, there are quite a few different brands and models to choose from. Sifting through battery chargers can be a pain in the neck. Generally, you want to look for a 3A charge rate (at least) and a charger that can drain your NiMH batteries first, before charging them. That will help your NiMH batteries last longer. A charger that supports both NiMH and LiPo is a great investment since you won’t have to buy a new one if you ever want to use LiPo. If you’re still with me, then congratulations! You now have all of the knowledge necessary to dive headfirst into the world of R/C. There is quite a lot more to talk about, however. Topics like suspension set-ups, differentials, and gear types deserve whole articles. What we covered here is only what’s most important for a beginner to know.